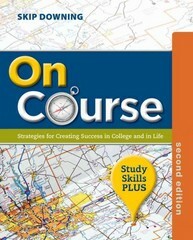 On Course: Strategies for Creating Success in College and in Life 2 Edition ON COURSE: STRATEGIES FOR CREATING SUCCESS IN COLLEGE AND IN LIFE, STUDY SKILLS PLUS EDITION was created for educators who would like to promote student growth and self-awareness, while providing more extensive instruction in study skills. Downing's powerful guided journal entries have been retained from the original ON COURSE text to encourage students to explore essential life skills such as personal responsibility, self-motivation, interdependence, and self-esteem. The Study Skills Plus Edition engages students in a learner-centered construction of study skills knowledge, and gives students practice in applying empowerment strategies. The 2nd edition highlights the very process of learning how to solve academic challenges with improved study skills. Students engage in critical and creative problem solving that will enable them to achieve greater success in all parts of their lives. The 2nd edition also features expanded coverage of diversity, emphasizing the many ways in which people are different and how these differences often influence the choices they make. Other new topics include a discussion of academic integrity, how to thrive in the college culture, and a research-based section on the importance of developing a growth mindset. Plus, a new Annotated Instructors Edition guides instructors to relevant exercises and materials in the ON COURSE FACILITATOR'S MANUAL. Available with InfoTrac Student Collections http://gocengage.com/infotrac.